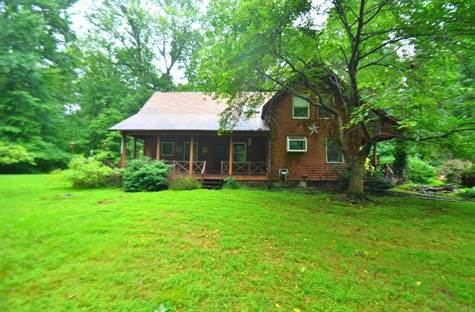 "Trade up to this home and we will buy yours" One of a kind Log home on nice wooded lot. There is plenty of natural light in the living room with cathedral ceiling and 2 sided fireplace. The eat-in kitchen has a center island and pantry with plenty of storage. Also on the main floor there is a nice full bath and large bedroom that could be utilized as an office or family room. The second floor has a master suite with walk-in closet, additional bedroom, full bath, and loft area. Full basement with outside entrance and even more storage space. Placed on over an acre of land on a secluded lot!